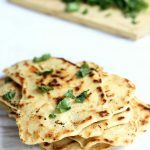 This quick naan recipe requires no yeast — so you don’t need to let it rise, and can have naan in a jiffy! Easy, and tasty! Combine all dry ingredients, and whisk together. Create a well in the middle of the dry ingredients, and add the oil and milk. Mix everything together until it forms a ball. Turn out on the counter and knead until very smooth and elastic — at least 5 minutes — adding more flour as necessary. Let the dough rest for 10 minutes. Divide into 8-10 equal pieces. Heat a skillet over medium-high heat. Roll one piece of dough until very thin (less than 1/8″). If the skillet isn’t non-stick, melt some butter before each piece. One at a time, cook the naan for about 90 seconds, or until parts are blackening, on each side. When they are done, you can brush them with butter and add seasonings (cilantro, garlic, etc. ), if you want. To be honest, I don’t have a measuring cup so this is an estimation. You may need to add slightly more — you want it to be moist, but not loose.